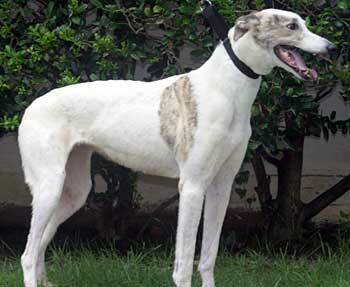 Posh Spice, aka C’s Shake Loose, is a gorgeous 6½-year-old white and brindle female, born November 19, 2000. Her sire is SKE’s Dixiesaint and her dam is Midland Shandice, and she is sister to Ginger Spice, Baby Spice, and Sporty Spice. Posh arrived with her sisters from a brood farm that was going out of business, and she never had puppies. Her racing days started October 19, 2002, at Seabrook in New Hampshire, and ended April 7. 2005, at the Birmingham track in Alabama. Posh is quite posh, indeed. She smiles more than her namesake, though. She wasn't that interested in cats. She watched them walk across the floor and jump up onto a counter or chair back, then she was off to check out the house. She took a few sniffs of the cat on the table, then another one batted her on the nose pretty good. So she passed with the cats. As always, I suggest close supervision. We will introduce her to small dogs at a later date. We would like to get her settled into a foster home first. Posh Spice is the happiest morning gal I've ever seen. No matter the time we get up, she's right there with her little smile and wagging tail to make sure we safely get to the coffee pot before she goes outside to do her business. She loves to play with our other two greys and will sniff and perk an ear when our cat sashays by, but that's about all Posh cares about her. Our two kids love brushing her and laughing at her squeak-toy antics. She has been the ultimate houseguest, with nary an accident. She LOVES soaking up the rays and just looking up at the sky when she's lying outside. Our slick tile and pergo floors are no match for this agile girl. 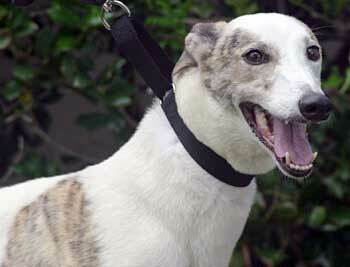 She's a greyt beauty with a greyt personality who would fit into any loving home. really, really, wanna GET ADOPTED!! If you want my future, forget my past. If you wanna adopt me, better make it fast! Get a few squeak toys and we can be just fine. If you wanna be my owner, I will be your forever friend. Make it last forever, friendship never ends! Lots of belly rubbies, but that's the way it is.